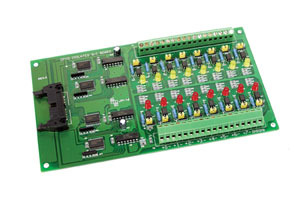 The OME-DB-16P is a 16 channel isolated digital input daughter board. The optically isolated inputs of the OME-DB-16P consist of a bi-directional OPTO-coupler with a resistor for current sensing. You can use the OME-DB-16P to sense DC signals from TTL levels up to 24V. You can also use OME-DB-16P to sense a wide range of AC signals. You can use the board to isolate the computer from large common-mode voltages, ground loops and voltage spikes that often occur in industrial environments.